By the summer of 1985 the disadvantages of having a fixed price point - �1.99 in the UK and the equivalent in USA and Europe - were becoming clear. Retailers were not happy, comparing their profit per unit (say 60p a unit) to the margins on full price games. Full price meant anything upwards of �5.99, though most games retailed at �7.99 or �8.99. In addition Mastertronic was limited in the royalty rate it could offer to programmers and on the production costs of each game. The logical solution was to increase the price but this conflicted with the ethos of the company, which had made its reputation on its low price. The MAD range was born with the promise of better quality games but by pitching the retail price at �2.99 we tried to kept faith with our loyal customers. 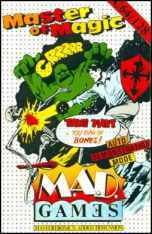 Sales of MAD games never matched the best of the �1.99 range. MAD stood for Mastertronic Added Dimension but the abbreviation was probably thought of first. 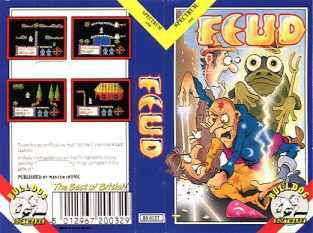 The first four games on the label were released in October 1985 and shown to the world at a press launch, on a boat on the river Thames in London. Each programmer demonstrated his game. The games were Last V8 by David Darling, Master of Magic by Richard Darling (1st from left, I think), Spellbound by David Jones and Hero of the Golden Talisman from Mr. Chip Software (written by Shaun Southern). Also demonstrated that night was a 199 game, One Man and His Droid by Clive Brooker (3rd from left). 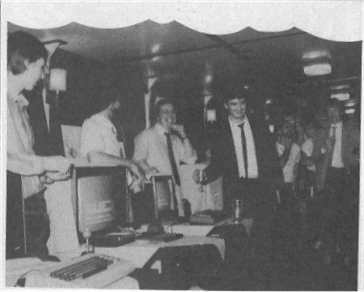 I think the young man in the dark suit was Jon Young, one of our games testers,who left us the following year to pursue a career in business software. The covers were completely redesigned compared to the 199 range. The only mention of Mastertronic was in the name tag at the foot. All the early MAD covers featured big cartoon characters on a dotted background. a sharp contrast to the science fiction realism of the early 199 covers. The photo above was in Crash, issue 23 and the original article is here. During the spring of 1986 Mastertronic worked to improve its distribution and production facilities in the USA. At that time we subcontracted to a disk duplicator based in Frederick, Maryland, run by Gary Snyder. Virtually everything was for the C64 but there was a growing interest in the IBM PC market. We wanted to run our own business and as part of the process began working with American authors. A new label - Entertainment USA - was created to showcase this material. The first release was Bump Set Spike in May 1986 written by (Canadian, I think) Ken Grant, then Video Poker from Randall Masteller, who later worked on a number of conversions to IBM format for us, and in June the highly successful Ninja from Utah-based Sculptured Software. 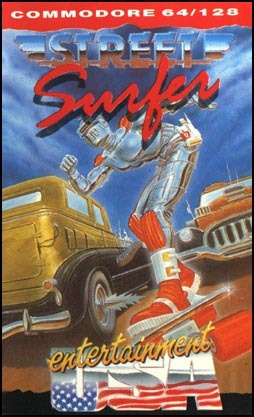 Later that year Sculptured wrote Street Surfer, Panther and LA SWAT, three of my favourites. It is curious to see the differences between these two inlays - Ninja has the colour flash across the corner like the classic Mastertronic 199 inlay but Street Surfer has the bar across the top, like the revised 199 inlay. The five gold stars on Ninja are not repeated on Street Surfer, and Ninja says "from Mastertronic" whilst Street Surfer does not. Both inlays are strong and striking full colour images. There were no more than a handful of releases on the Entertainment USA label. Whilst the C64 version of Panther was released in 1986, the conversion to the Spectrum was delayed until August 1989. 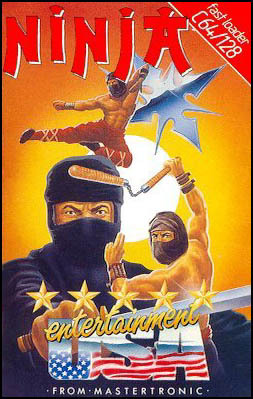 That version appeared on the Mastertronic Plus label. In the autumn of 1986 one of our customers, a wholesaler in Stoke, was in financial difficulties. They owed us about �30,000. This company, Bulldog Distribution, was owned by Melbourne House, itself having problems. Rather than put the company into liquidation, we were asked if we would like to take it over. We did, and found ourselves in possession of a warehouse full of games of varying qualities and an enormous amount of accounting work (that fell on my shoulders). Nobody at Mastertronic had any idea what to do with Bulldog and within a few months we shut it down, bringing its managers back to London to work for us. But at least we had the rights to the name. Feud, written for us by our new partners Binary Design, was released in January 1987, and retailed in the UK at �1.99. The inlay style is in sharp contrast to the normal Mastertronic 199 range. There is no mention of Mastertronic on the front. The machine colour flash has moved to the left. The Bulldog Software logo appears at the base and on the rear cover, together with some excellent screenshots. The small print at the back "published by Mastertronic" makes it look as though Bulldog was a distinct business. It was not - it was never anything more than a name. It made a nice contrast to Entertainment USA but there was no real reason for it. And as with Entertainment USA, we issued no more than a dozen titles on this label. Incidentally, we also planned to use the name Entertainment UK but one of our major customers, a distribution company called Record Merchandisers also wanted to use it. RM was wholesaler to Woolworths and other major high street stores and we thought it politic to let them use the name. RM actually changed its name to Entertainment UK at this time.